Fully closed loop servo system ideal for micro linear actuators, grippers, and other miniature precision devices. PA15 Ball Screw Actuator with a 1mm pitch screw and stainless steel body. For small stroke applications such as repetitive testing or microscopic visualization automation. The RRA11 is a high speed tubular rack and pinion system designed for dispensing applications. Use of Peek Polymer pinion and bushings result in a lubrication free device. Programmable serial interface option. Includes programmable I/O and analog interface options as well. 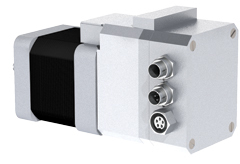 Programmable serial interface option including multi-axis co-ordinated motion functions. Fully closed loop servo system ideal for micro linear actuators, conveyors, and other miniature precision devices. Fully closed loop servo system ideal for pick and place, conveyors, photonic's stages, label feeders, or peristaltic pumps. 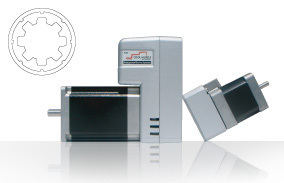 The PA26 series ball screw actuator comes with a precision screw in pitches of 2mm and 6mm, with strokes up to 211mm. The dual bearing tracks result in a very strong carriage assembly handling greater moment loads. The PA33 series ball screw actuator comes with a precision screw in pitches of 6mm and 10mm with strokes up to 611mm. The dual bearing tracks result in a very strong carriage assembly handling greater moment loads. RD-45T Series electric cylinders are capable of forces up to 400N with speeds up to 600mm/sec. Screw pitches of 6mm and 12mm are available with strokes up to 200mm. The RRA17 is a high speed tubular rack and pinion system designed for dispensing applications. Use of Peek Polymer pinion and bushings result in a lubrication free device. Rack lengths up to 500mm. Right angle, single shaft OR double shaft, helical gearbox. Available in 32, 42, 60, and 90mm frame sizes. Right angle, rotary stage OR double rotary stage style helical gearbox. Available in 42, 60, and 90mm frame sizes. Right angle, through-hole with collar OR double collared, helical gearbox. Available in 42, 60, and 90mm frame sizes. Fully closed loop servo system for pick and place, conveyors, lifters, entry systems, machine setup, rapid feeders, and other precision devices. Features zero backlash belt to pulley design and corrosion resistant components. Up to 1.7m of travel. High speed belt driven linear actuator made of corrosion resistant materials and featuring a zero backlash belt to pulley design. Up to 2.15m of travel. RD-55T Series ball screw cylinders are capable of forces up to 800N with speeds up to 600mm/sec. Both 6mm and 12mm pitch screws are available with strokes up to 300mm. The RRA23 Rack and Pinion Actuator is designed for heavier loads. It is ideal in tight spaces and applications like lane diversion or light pressing applications requiring torque control. 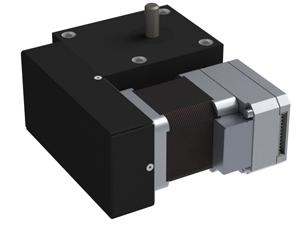 The RRAD23 Dual Rack and Pinion Actuator is designed for unique applications where symmetric or lengthy actuation is required. Fully closed loop servo system ideal for moving heavier loads with accuracy on ball screw actuators and belt drives. Mate to a planetary gearbox for additional lifting power. A fully integrated servo system including numerous built-in functions with I/O designed to shorten design time and increase performance. CM2 CML Users Guide This PDF outlines the CM2 programming language with usage examples. The CM1-E adds EtherCAT communications and control to the Cool Muscle integrated servo line. In addition to support for the CiA402 drive profile, the CM1-E also adds secondary power to maintain control and encoder communications during emergancy stops, and additional I/O points reducing the need for networked I/O modules. 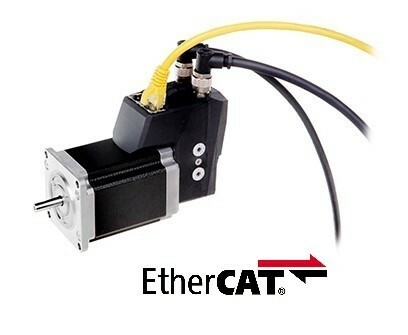 Muscle Corporation offers a 4 axis EtherCAT bridge, providing a novel solution for adding EtherCAT to your machine. The bridge allows up to 4 standard Cool Muscles in the -EB configuration (i.e CM1-C-17L30C-EB) to be added to an EtherCAT network. This allows both CM1 and CM2 servos to be accessed ocross the same network, along with each motor's indivual I/O. Control Room is provided as a graphical user interface for both CM1 and CM2 Cool Muscle integrated servos. Settings and programs can be modified and saved either to the motor or to your PC. Control Room is available for download in the software section of this site. If required, our skilled staff will work with you to identify specific operation requirements and implement custom electronics, software and touch panel interfaces. We are committed to providing the solution that works for you. Define motion profiles and create programs using easy-to-understand Cool Muscle Language (CML). Motion programs you create can be stored in the Cool Muscle’s EEPROM. The programs can be executed via PC, embedded computer or triggered using I/O. The Cool Muscle’s real time operating system precisely controls I/O timing allowing for PLC style I/O operation. Logic banks provide a flexible logical and mathematical capability equivalent to that offered by traditional ladder logic. Uder defined actions can be triggered by external inputs or by internal motor conditions such as speed, torque or position. Program the Cool Muscle to create the motion you need. One of Cool Muscle’s latest advances is the addition of the robust H Inifinity controller. Unlike PID systems, the H Infinity controller handles changing load dymanics with ease. From inside CoolWorks, our interface software, the H Infinity controller can be run through an auto tuning system to quickly assess your mechanism’s load and configure the control system for optimal responsiveness. Call us today for a demonstration and find out why 90% of customers who try our products buy our products. Myostat Motion Control Inc. a line of Robust Industrial Interfaces for the CM1 Integrated Servos. Options include RS-232, RS-485, MODBUS TCP, EtherNET IP, EtherCAT, TCP/IP Ethernet, and USB. The Ethernet/IP interface provides direct communications over standard ethernet hardware to compliant Ethernet/IP controllers, providing a familiar interface to new, cost effective, alternative motion solutions. 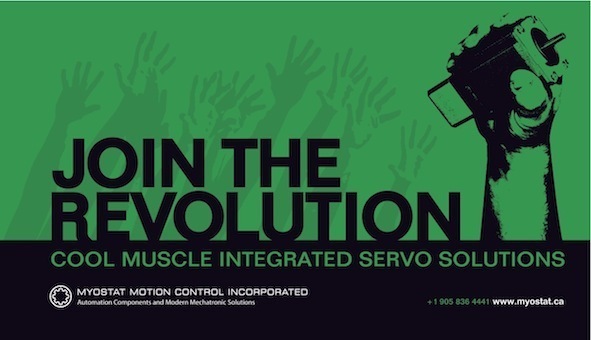 What is the Cool Muscle integrated servo system? The Cool Muscle line of servo motors provides all the common components required for motion control embedded into the motor itself. The seamless integration of both software and hardware components create highly efficient motion modules that can be easily integrated into existing designs, or used to shorten the development cycle of your new machine. Find answers to frequently asked questions or call us at 905-836-4441 for more information. Myostat Motion Control now offers Break Out Boards with optional DIN mounting systems available for both the CM1 and CM2 motors. Boards are available in both prototyping and production formats. Click here for drawing details. 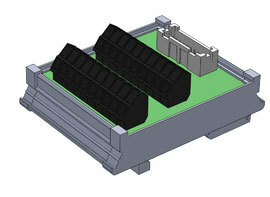 Myostat recently released an integrated EtherCAT Cool Muscle with CiA402 support and separate drive/controller power. This PDF give a quick overview of the motor line. 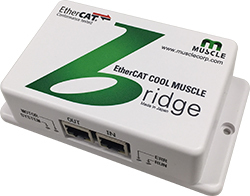 The EtherCAT Cool Muscle Bridge is the interface (device) that connects Muscle Corporation&#8217;s Integrated AC Servo System, Cool Muscle 2 and/or Cool Muscle 2 (hereafter referred to as CM1, CM2 or CM1/ CM2 or collectively called Cool Muscle or CM) to an EtherCAT network system. Join our email list to receive the latest news in your inbox. Web Design - Treefrog Inc.
What is a Belt Driven Actuator? What is a Ball Screw Actuator? Why Use an SR Joint?